Thinking about buying a Nest Thermostat? Make sure to read my Nest Review first. Let me start my Nest Thermostat Review by saying that I think it is an incredible product. I never thought I’d get excited about a thermostat. The Nest Thermostat has both sizzle and some steak. After we recently moved to Denver, we knew there would be a huge issue with our house getting too cold while we weren’t there. On top of that, we wanted to make sure when we got home, the house was warm (or cool). It’s incredibly well designed and easy to use. It’s like it was made by Apple (oh wait, it was made by the same the gentleman who designed the original iPod). The simple turn up or down display is all you need to know. It’s so easy my tech-adverse wife even loves it. It’s very easy to use. You simply move the wheel around to make it warmer or cooler. It learns your behavior (there are several motion sensors in the Nest) and the Nest Thermostat automatically changes the temperature for you based on your schedule. No complicated controls or trying to figure out the Thermostat’s funky settings. The setup is easy, even for a home improvement noob like me. Simply unscrew your old, antiquated thermostat and follow the instructions provided. Be sure to take a picture of your old thermostat and make sure the wires go in the same labeled-spot on the Nest, so you’re good. Nest even includes a screw driver, so you don’t have to worry about even having the right tools. 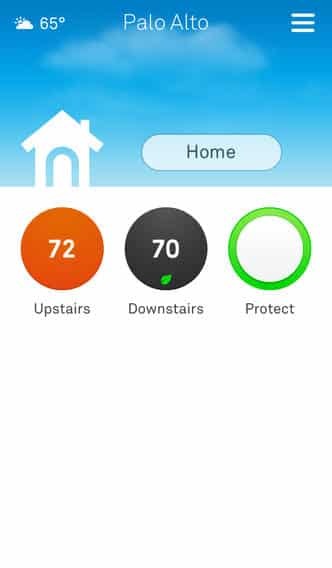 I loved the iPhone/iPad/Web interface for managing the Nest. When I would head home early from an event, I could adjust it on the go.If I left at an unusual time, I could also turn it off from my iPhone. Customer service is really great. I originally had a Nest at a condo without the proper voltage. You talk to someone in America and they are super helpful (more on them in a second) and you don’t have to worry about endless old times. The Nest Thermostat has an interesting feature called “Air Flow.” This was more helpful in Texas than Colorado, but this turns off the air conditioning, but leaves the fan on – as the coils are still cold. This saves money by utilizing the cool coils, but not powering them – only powering the fan. It saves you money. I know you’ve accidentally left on your thermostat before or didn’t even think twice about how your thermostat could save or cost you money. The Nest makes you think about your energy usage with monthly reports and how to help you save even more. The Nest works really, really well on most thermostats. However, my first Nest, in a Condo, did not work the right way. I called support several times through the course of the issues and they were all very enthusiastic and helpful. But several gave me the conflicting advice. I would recommend a Nest, without skipping a beat. Just make sure that your HVAC system is compatible. It will save you money, allow you to have better control of your spending and be a great, convenient addition to your home. The Nest is one of the few gadgets that will make you cooler.